These mom-tested tips and tricks will make you a pro fast—whether you want to learn to rock climb or surf or Zumba. Yes, You Can Surf, Golf, Ride That Mountain Bike! So you want to learn to...surf? Golf? Mountain bike? Most of us have at least one sport we've been dreaming about for years. We just know we'd love yoga, get a kick out of stand-up paddling, or rock it on a roller derby team. But we also feel daunted; will we have the right gear, be able to keep up, or just plain look silly trying? If this is you, fear no more. Here, from expert teachers across the country and women who've taken on a new sports challenge and triumphed: what you really need to know to make your dream sport work for you. The gear challenges alone make this sport a hard one to tackle on your own. 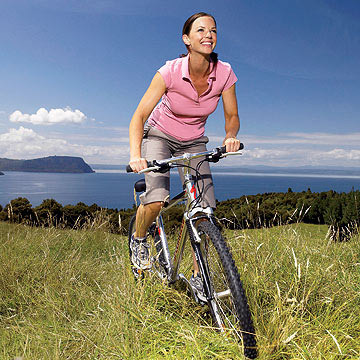 Mountain bikes are very specialized these days, and buying your neighbor's used one is likely to lead to discomfort at best, serious injury at worst. Instead, find a group class, preferably one with a bike provided for each student and teachers on hand to demonstrate good riding technique. And if it's an all-women class, so much the better for support and camaraderie. Maery Rose, who writes the blog Cowgirl By Proxy, learned to mountain bike for the first time at Ladies Night at Hillside Park in Elk River, Minnesota, and says having bike specialists there to outfit her properly for the experience was key. "I brought my own bike to the event but didn't end up riding it, which is a good thing. I couldn't believe how much of a difference it made riding on the bike they provided! I felt so much more centered, balanced, and secure." Rose is already planning to buy her own bike, and thanks to the class she knows exactly which one she wants. Learning in a group was not only supportive, Rose said, but she met several potential riding buddies with whom she plans to ride in the future. One of the trickiest things about golf is how deceptively easy it looks, says Cindy Reid, author of Cindy Reid's Ultimate Golf Guide for Women and founder of the Cindy Reid Golf Academy for women. In reality, it takes a fair amount of technique, practice, and skill building before you're ready to try even a novice 9- or 18-hole course. "I tell beginners to take at least three lessons before taking their first full swing," Reid says. And while golf, once you get into it, is renowned as a social sport, at the beginning you're much better off going it alone, Reid says. "Go to the end of the range so that you isolate yourself and have your back to the other players," she says. "All that matters is you, the club and the ball." Don't tackle everything at once, either, Reid says. "It works best to practice with specific goals," she says. "If your instructor has given you one fundamental or one key swing to work on, spend the day working on that and don't jump from one goal to the next in the middle of a practice session." Lastly, no matter how excited your husband or friends are that you're finally embracing their game, ban their suggestions. "Women are quick to take advice from husbands, boyfriends, and fathers, but everyone's golf game is different. You are not going to swing like your husband or boyfriend, so don't try or you'll just get frustrated." Instead, she says, find a teacher you like and work together to develop your own approach. The real secret, she says: "Find your own swing." This relatively new sport, which has been catching on all over the country in the past two years, isn't the only sport Gina Bradley teaches—she's also a certified dive instructor as well as surfing, kayaking, and mountain biking teacher. But it's her favorite because it's so accessible. "If you can walk, you can stand-up paddle," says Bradley, who founded Paddle Diva in 2009 to reach out to women who long to be on the water but find surfing and kayaking too intimidating. • Find a female teacher: women learn SUP better from other women. "Especially if you have any fear or anxiety—a woman teacher's going to be much more empathetic and able to help you get over that." • If you're fearful about falling in, learn on a calm body of water rather than rougher beach surf. 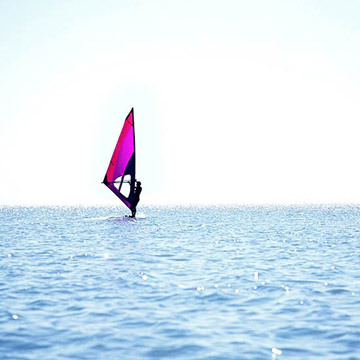 • Choose early morning classes; the water is almost always calmer in the mornings before the wind kicks up. • Wear a bathing suit or something quick-drying rather than a wetsuit. "If you fall in, you have to get back up on the board and a wetsuit won't dry, so then when the wind blows you'll get chilled," Bradley says. • Wait to buy your own paddleboard until you're sure you like the sport, then buy new and have it sized for you. "There have been so many innovations in SUP just in the past couple of years; if you buy an old board you're likely to get something that's much harder to maneuver," says Bradley. Here's what not to do, says Melinda Hawkins of San Francisco. "I tagged along with a new boyfriend who was leading a trip to Yosemite. On our first day I discovered that I'm afraid of heights and got into a situation where I was completely stuck—I couldn't go up or down and someone had to come guide me down. It scared me off climbing—and wrecked the budding relationship too." Twenty years later, Hawkins attended a party at an indoor climbing wall and discovered she actually had an aptitude for climbing—as long as she didn't look down. The next step was a beginners' class at Planet Granite in San Francisco, and now she spends weekends with a women's adventure group that takes on progressively more difficult climbs. "A beginning class starts with the basics, like knots and belaying, and also teaches safety," says Hawkins. "Knowing you're secure is really key—it boosts your confidence and makes it much more likely that your first real rock experience will go well." 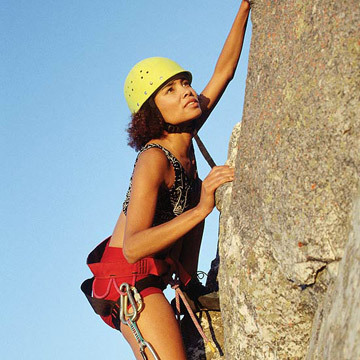 REI hosts beginning and intermediate rock climbing classes throughout the west; in Boulder the Women's Wilderness Institute even teaches a mother-daughter rock climbing course that welcomes girls over the age of 8. No question that learning to surf is a challenge, but it's not nearly as hard as many women think, says Lexie Hallahan, founder of Northwest Women's Surf Camps in Seaside, Oregon. Nor does it take being in super shape to manage it. "I've had students who were in their sixties and seventies, I've had students who were moms of three or four kids with 30 post-baby pounds still to lose," Hallahan says. "And that mom of three might learn faster than a triathlete with washboard abs." It helps, Hallahan says, to have a good sense of balance so if you do yoga or another balance sport, you're one up. And whether your goal is big-wave surfing or kite-surfing on your local lake, you can get a head start if you try bodyboarding first. Bodyboarding—also called boogieboarding—is easier for most women, Hallahan says, because "Our legs are typically stronger than our arms so kicking out to meet the waves is easier than paddling. It's a great way to gain wave knowledge and experience and makes the transition to surfing so much easier." And don't think you have to plan a luxe vacation in Hawaii or Mexico to learn to surf; it's better to learn close to home, even if conditions are less ideal. "If you just surf when you're on a tropical vacation, you'll maybe surf once a year and you'll never get any better," she says. "If you learn in your own backyard, you'll be able to go whenever you want. You'll learn much, much faster that way." Of course you want to learn on a beginner-safe beach, but that's not as hard as it sounds because your local surf or kite-surf school will choose one for you. Of course, if you don't live near the coast or a lake, learning locally isn't an option, but choose somewhere you can visit regularly. In terms of gear, women should learn on boards sized specifically for them, Hallahan says. "Men's boards are not only too long but they're wider, too, so they're hard for a woman to carry." • Clear instruction on the steps. Some teachers will add an extra half-hour lesson at the start of classes for new students. It's also nice if they stop regularly when introducing a new routine to make sure everyone's clear on the steps. • Supportive classmates. Some classes feel like they're for serious, advanced students only, and that's fine—but it's not a good place to start. Find one where several of the students are also relatively new and in which students come in all shapes, ages, and sizes and you'll feel much less self-critical when looking in those floor-length mirrors. • A relaxed environment. Zumba classes at a local high school or community center may feel more relaxed and accepting of beginners than those at a dance studio, for example. If you find a class you like, make a regular commitment; many teachers encourage this by offering a discounted price for a series of classes. Carrie Murphy's obsession with Zumba has only grown over the years; she now takes at least three classes a week and has dropped 30 pounds as a result. A final tip from the experts: Don't worry about having the right clothes. For a beginner, any regular gym clothes and tennies will do. Later on, if you become a Zumba devotee, you'll probably want to buy dance shoes just because they slide more easily, allowing you to be more graceful. 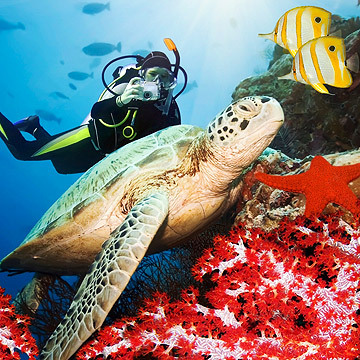 For most people, step one in getting up close and personal with undersea life is snorkeling, which is a good way to test your comfort level with breathing underwater. The only real obstacle to snorkeling enjoyment is comfort, says certified dive instructor Gina Bradley. "I hear about so many women going out with an ill-fitting mask and fins, and then they can't see anything because their mask fogs up, they can't breathe right, their feet get blisters—that's not a good way to experience snorkeling." The problem is that most dive shops don't have equipment sized for women, so you're just wearing mens' gear buckled tighter. If possible, buy your own gear and bring it with you, Bradley says; snorkeling equipment isn't expensive so this is a relatively easy fix. If you don't want the encumbrance, then arrive at the dive shop early, while they're still well stocked with sizes. Claustrophobia and fear of deep water are much more likely with scuba diving, so you're better off learning at least the first part of a certified dive course at home, even if your first open water dive is going to take place on a trip. "Take baby steps and build up your comfort level slowly," says Bradley. "I love the YMCA for scuba because the classroom portion is done in heated pools and you can stay in shallow water until you're comfortable." If you've seen people in your area walking with an odd gliding gait and holding what look like ski poles, they've embraced yet another fitness craze, Nordic walking. Based on the principles of Nordic skiing, it's an all-weather attempt to get the same fitness benefits—and it works, says Karen Asp of Fort Wayne, Indiana, the current American Nordic pole walking champion. In fact, according to the American Nordic Walking Association, pole walking burns 30 percent more calories than even fast-paced fitness walking, while building upper body strength as cross-country skiing does. It's also low stress, so it's great for people with joint problems. 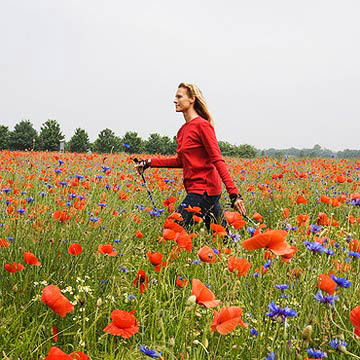 Nordic walking poles come in two types, adjustable and fixed-length. Adjustable are best to start with so you can see how they feel best. The one problem with them is they can collapse if you put too much weight on them, so some Nordic walkers use fixed-length poles for this reason. Other than the poles, you don't need any other equipment for Nordic walking, though many people eventually switch to specially designed shoes. With health gurus touting the benefits of yoga to anyone over the age of 5, it's easy to feel left out if you've never attempted a downward dog. But what if you don't fit the mold of the leggy, willowy girls you see toting yoga mats all over town—can yoga really be for you? "Honestly, my experience has been that yoga truly is for anybody," says Martha Johnson of Framingham, Massachusets. "Even if you can't do every asana, there's really no such thing as failing at yoga. My first few weeks, I felt like an elephant lumbering around, but everyone's concentrating on trying to get their own bodies into position and no one even looked around." And with the abundance of different yoga styles available, there's one suited for you, no matter what your age or fitness level. Follow these steps to get started. 1. Start slow. Choose a level one or beginner class. 2. Choose a slower variety. Iyengar yoga is one good style for beginners, because it features extra attention to proper alignment. Iyengar also uses lots of props, so if you're less flexible you'll still be able to do the poses using blocks, folded blankets, and straps to extend your reach. Vinyasa flow is another slower, more relaxed style of yoga. Steer clear of Bikram (hot) yoga and Ashtanga yoga, with their focus on faster, more athletic sequences. 3. Go with a friend. Having a yoga buddy who feels equally awkward and silly goes a long way to breaking any tension or anxiety you might feel. 4. Buy a mat and blocks and practice at home. Not only will you feel comfortable in class much faster, but a few yoga stretches are a great way to start or end your day. So you saw Whip It and now you're sure you're destined to be the next Babe Ruthless? No problem. The roller derby craze has become so widespread, there's a league just about anywhere you look. "I saw a post on Craigslist that a new team in my area was recruiting," says Jayne Mayer of Philadelphia. "I showed up to a meeting and that was all it took. Except then I had to get out and practice!" Other roller derby enthusiasts heard about a team at their local rink, searched online by googling "roller derby" and their town, or checked the derby roster maintained by International Roller Derby Worldwide. If you don't already know how to skate, of course, that'll have to happen first, Mayer points out. But even that's not a real obstacle. Get down to your local rink and practice a few times; if you're still as enthusiastic, buy your own skates and add extra practices or take lessons. Some skaters train both at the rink and outdoors; for outdoor skating, you'll need inline skates, also called rollerblades. However, to master the speed, crossovers, jumps, and other moves central to roller derby requires a banked track. With a name as mysterious as spinning, it's no wonder so many people feel intimidated by this new gym staple, which is a high-intensity variation on stationary cycling that was designed for cyclists. "My friends kept trying to drag me to their spin class and it just sounded like something I'd hate," says Sarah Fenton of Portland, Oregon. "And sure enough, my first class I was like 'You guys are crazy!' I was dripping with sweat and so sore. But I decided to give it one more week, and when I saw how fast I started dropping pounds and getting sculpted, I was hooked." Because of the equipment needed, spinning isn't something you can just jump into unprepared, however. The secret to spinning success is to outfit yourself for cycling first. If you don't already own padded bike shorts, invest in some—they'll save your tush from some serious soreness. You'll also be better off with bike shoes, which have a stiff sole that helps your feet stroke down with more power. 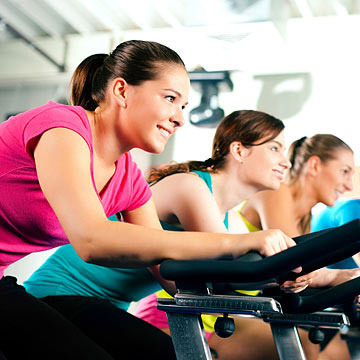 Some gyms have spin bikes that require clip-on shoes and others don't, so ask ahead of time. Then go to your local bike store, tell the clerk what you need, and you'll be on your way in no time. Starting college at U.C. Santa Barbara was what launched Samantha Schultz on her volleyball craze. "Santa Barbara city beach has these nets on the sand and there are games going all the time. Everyone looked like they were having so much fun but I didn't want to make a fool of myself. So I enrolled in a PE volleyball class and now it's my favorite thing to do to burn off stress on weekends." Whether you just need a refresher to remind you of the volleyball you learned in high school or you're starting from scratch, your best bet is to join one of the classes offered by sports clubs, gyms, rec centers—even your local community college. Schultz found a class at UCSB and never looked back. "Just knowing the basic moves—how to spike, return a shot, or get a serve over the net boosts your confidence. That way you can jump into a game and not worry so much about letting your teammates down," she says.